I designed this card from a sketch at Meljen's Designs for the challenge. Sweet Chocolate Bar is a digi stamp colored with copic markers. Doily was cut with Silhouette and inked with Tim Holtz, as well as the sentiment. Bakers twine, a little faux stitching and a flower to finish it off. Very pretty card and I love the colors you used. Thanks for joining in the Meljen's Designs Challenge this week. HI Penny, firstly welcome to blog land its a lovely social place to be and very friendly. Just love your card gorgeous colours and the faux stitching just finished it off. Beautiful card! I love the colors you used! Thanks so much for joining us at Meljen's Designs! Such a cute card! 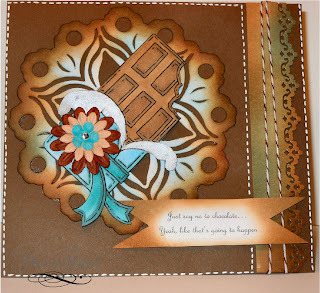 I love the beautiful browns and the border work! Thanks so much for playing along at Meljen's Designs this week!